How do you share content on the Web? Do you blast links across Twitter, share stories on your Facebook status, or e-mail an interesting item privately to friends or associates? If you use social media to share content relevant to your business, what's the best way to get attention? A study released today by ShareThis points to some interesting findings. The company, which builds sharing widgets, examined the clicking habits of about 300 million people who use its ShareThis button on about a million Websites. The data has to be taken in context; it's not all Web sharing, just that which passes through the ShareThis widget. The report's numbers also represent the percentages of actual clickthroughs, meaning content shared that someone clicked on. The raw sharing numbers are higher, because people broadcase content via social media that nobody ever clicks on. Overall, sharing content accounts for 10 percent of all Internet traffic and 31 percent of referral traffic to sites from search engines and social media tools. 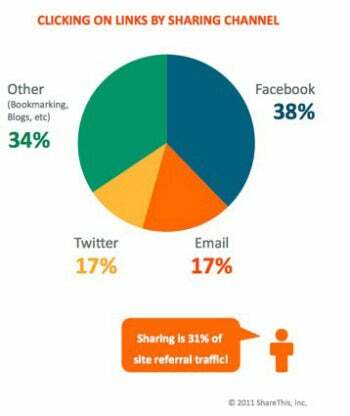 Facebook accounts for 37 percent of sharing traffic. Twitter accounts for 11 percent of sharing traffic, and e-mail for 17 percent. Eighty percent of people sharing will share only one category: Business, Health, or Arts & Entertainment, and so forth. Of those categories, content that falls into ShareThis's "Arts & Entertainment" category was shared the most frequently, at 65 percent of all sharing. "Health & Sciences" was the least popular, at 54 percent. What are the takeaways for a company's outreach strategy? Obviously, be relevant when sharing links on Facebook and Twitter, but also understand the limitations of those services. We often get carried away about the game-changing potential of social media. Ten percent of all Internet traffic is significant, but social media is only a part of a successful online outreach strategy. Secondly, broaden your reach. As noted above, 80 percent of users will only share that falls within one given category. So if you run a health-food business, create content that would break out of the "Health & Lifestyle" categories. Talk about your business model, community engagement, and environmental impact. Expand your reach to expand your audience.